World Speech Day is dedicated to celebrating speeches, speech making and raising ideas. There will be a host of live speaking events, taking place across the world on the same Day. These events may be small and local, or large and global. They could be at a school in London, or a church in Mexico, at an Agency in Nigeria, or at the UN General Assembly. World Speech Day Lagos Ikeja event is licensed to and organised by Florence Atunwa Olumodimu of Life Developers Network, a social enterprise dedicated to helping individuals maximise their potential. She has partnered with Banke Alawaye of Praekelt to bring together speakers from organisations in different sectors and with different outlooks to share their ‘Thoughts for a Better Lagos’. Florence has invited speakers who will give a short, 5 minute speech each on the Theme: ‘Thoughts for A Better Lagos’; these will be followed by an open mike session. President Kennedy once said that “the only reason to make a speech is to change the world.” World Speech Day is fashioned around a simple theme: Change The World. Everyone who takes part in World Speech Day is encouraged to put forward their ideas on how to make the world better. 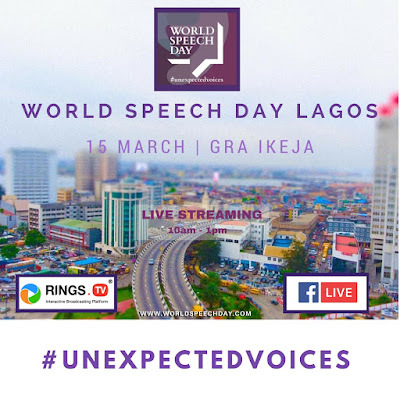 World Speech Day, Lagos Ikeja #WSDLIkeja will act as a source for new thinking – releasing the “wisdom of crowds” – gathering ideas from the #unexpectedvoices, usually unheard voices of Everyman. It is about tapping into the truly original and inspirational – and then making these voices available to the world. The offline event is strictly by Invitation but everyone can join in by watching the live stream and following the real-time updates on social media on March 15 2017. WSDLagos Ikeja event will be recorded on video and Livestreamed via RingsTv app available from the Apple istore and Google Playstore. It will also be Livestreamed via FacebookLive and will form a unique resource, made available on wide range of platforms, such as a free website and YouTube channel.